We have been driving the Avventura ‘Powered by Abarth’, does it justify the Abarth badging? We find out. Fiat Avventura was launched in 2014, basically a Punto Evo with a raised suspension and added plastic cladding. Powering the crossover was a 1.3-litre multijet diesel engine and a lazy dazy 1.4-litre petrol that had no punch without the T-jet tuning and also missed out on basic safety features like airbags and ABS. 2015 is almost ending now and Fiat has given all the enthusiasts something to cheer about by plonking in an Abarth(Fiat’s performance wing) tuned 1.4-litre T-jet unit that churns out a hefty 140 Bhp of power! Fiat has not done much to the car cosmetically. Exteriors remain almost similar to the Avventura except for the 16’inch scorpion style alloys that look chic and a couple of ‘Powered by Abarth’ monikers on both the front doors and a red Scorpion badge on the engine cover under the bonnet. It is no doubt a good looking car with just the right amount of beefiness at all the right places. Front of the car remains unchanged with a honeycomb style air intake in the bottom which is surrounded by large fog lamp housing on both sides. Dual-port front grille gets divided into two parts by a chrome strip and the lower half of the grille is mostly covered by the number plate. Sides of the Avventura have black coloured plastic cladding which adds to the butch look of the car and the aluminium roof rails are lightweight, yet strong and functional. Rear mounted spare wheel is the main highlight of the rear end which gives this cross a character of its own. If you have been inside the Avventura, you have been inside the Avventura powered by Abarth, it is that identical. Dual tone grey-black dashboard theme feels classy and elegant. The grey bit on the dashboard is a soft touch material and the door pads get leather inserts. Above the air conditioner vents on the dashboard are three dials - a compass, pitch and roll which show the incline angle and the angle of approach. Though these are more particular to off-road vehicles, they add a techy feel to Avventura’s cabin. Boot hatch release button is placed on the top right area of the music system. You can’t stream media from your phone which is very disappointing and the ‘Blue&Me’ interface only supports voice calls and commands. You get USB/MP3 and AUX connectivity along with auto climate control with a rear AC vent. Safety wise, the car gets dual front airbags with early crash sensors and ABS with EBD. We sorely missed a rear parking camera/sensors as the car has poor rear visibility mainly because of the rear mounted spare wheel. Powering this crossover is a 1.4-litre Abarth-tuned T-jet petrol unit that churns out 140 Bhp of power and 210 Nm of torque. As soon as the engine springs to life, there is a mild exhaust note. However, it goes away as soon as you start building up the revs. There is noticeable turbo lag below 2000 rpm and the car feels a bit sluggish getting off the line. NVH levels have been kept well in control and there is hardly any engine sound or vibration inside the cabin. However, the scenario completely changes post-2500 rpm. If you have ever seen a werewolf’s transformation (of course in the movies), that is exactly what happens to this cross once you go hard on the throttle. There is oodles of power to play with and it pulls up cleanly all the way up to 6000 rpm. Fiat claimed 9.9 seconds 0-100 acceleration time is quite achievable and the engine delivers power consistently post 2000 rpm which makes overtaking on highways very easy. The hydraulic steering wheel offers good feedback when you drive the car normally. However, if you go hard on the throttle in the initial gears, perturbing torque steer can make even the best of drivers lose confidence. To simplify what torque steer is, it basically gives you a feeling as if the engine’s torque is controlling the direction of the vehicle. You often feel out of grip and balance coming out of a hard corner in the Avventura mainly because of its raised suspension forcing you to cautiously use the throttle. The gear shifts are also a bit rubbery and it again takes some time getting used to it. Ride quality is very refined and mature and 205 mm of ground clearance makes sure that you don’t need to worry about the inconsistencies in tarmac anymore. Disc brakes on all 4 wheels along with ABS and EBD ensure that a mere tap on the brake pedal gives you sufficient stopping power. Fiat claims an average of 17.1kmpl and if you drive it with a light right foot (which of course we didn’t), you can expect around 13-14 kmpl in real traffic conditions. Our market is seeing a paradigm shift towards driver focused cars. The Volskwagen Polo GT TSI is an example of that. Its sales figures super succeeded Volkswagen’s own expectations. Introducing the Abarth brand in our market is a good move by the Italian carmaker. 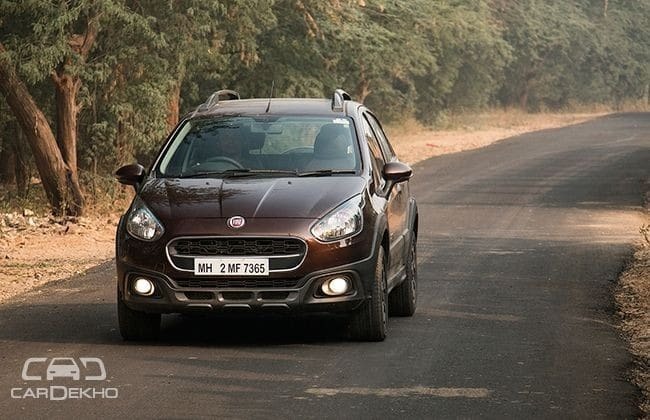 Abarth has given the Avventura a shot in the arm and if you want a good looking crossover with plenty of ground clearance and very responsive petrol engine which does a 0-100 kmph sprint in under 10 seconds, then this all new Fiat is the car for you. However, if you are looking for a more driver focused car with more power and a better suspension setup at a slightly cheaper price, then you should definitely consider the Abarth Punto.